I love this sweet little bear image from the Paper Creators store. 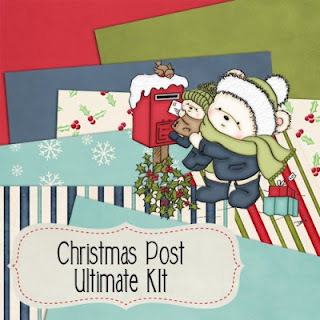 It's from a Ultimate Kit called Christmas Post and contains this image, several patterned papers, bows and a tag. I printed then cut out all the pieces with my rotary paper cutter. Attached them to a 5 X 7 card base. Reduced the size of the bow and cut out with scissors. I printed the tag using Pica10BT font and cut out with Paper Shapers punches. 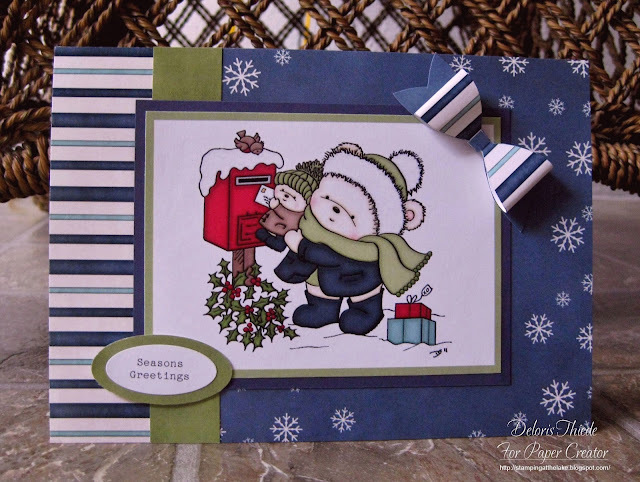 An adorable card Deloris, such a cute image. Oh, I love that image and your sweet card in blue. Too cute. The image is just too cute! Nice use of the kit! Thanks for sharing with us here at 613 Avenue Create! What a darling card. I love the image and the layers of papers. Thanks for joining us at Inspiration Destination. What a cute card! Love your coloring. Thanks for joining us at Holly Jolly Christmas Challenge.